Does anyone care about the future time line at all? I don't think I'm going to make it through this season let alone the next one. I actually like the future timeline more. From what I’ve read here and elsewhere I’m obviously in the vast minority. I’ve also read that they were supposedly looking at doing a Star City 2040 spin-off back it was looking like Amell might not want to do another season, but now that he is coming back for a final season the flash forwards will continue then. 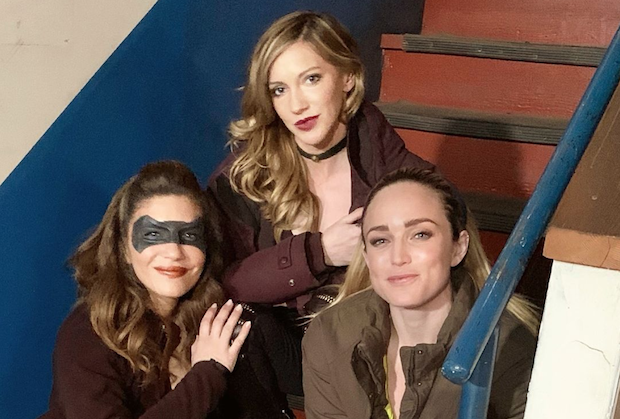 Nice to see Sara wearing the WHITE CANARY uniform again. For some reason there appears to be a NO uniform rule on LEGENDS this season. I know that most superhero actors bitterly complain to producers about wearing their costumes. Most of the time it adds an hour or more of their day wasted in wardrobe. That might have to do with a reduced budget? This episode felt like Katie Cassidy's swan song on the series. I took it as a final goodbye to her various characters. Though the entire premise undercut all of Black Siren's character development this season to fit the plot in one episode. Agreed. Maybe she has other jobs scheduled so this was their opportunity to resolve her arc, quickly though it was done. I actually liked her character at the end of the episode. She was a better character as Faux Laurel than the actual Laurel Lance. I still have no idea why they didn't just give sonic powers to the first Laurel from the start. It was a bizarre creative decision that added nothing to the character. While admittedly I no longer fully pay attention when I watch this, I still kind of felt like I had missed an episode during this entire hour. I think that was because of how rushed the Laurel story line was. It's almost weird seeing Sara as a serious character again. I would rather they keep this Laurel and get rid of Dinah Drake, but at this point I think I'm only still watching because it's ending early next year. That was when they had their "no powers" policy. After The Flash all bets were off. They should have given Laurel 1 powers after the matter reactor explosion. Would have made sense.